It’s always so hard to decide what to do on your birthday. It’s extra hard when it’s been a tough year and you know that great food is one of the only things that can make you feel really good. We were originally planning on taking a day trip to New York, but decided we wanted more time than the day would allow and decided to create our own day trip in the area. We started the day at Green Eggs Cafe–always a sure shot for their massive club or quinoa porridge (it was my birthday so I opted for the club, of course.) We had a nice meal, despite the throngs of folks celebrating Mother’s Day. Have I ever mentioned how AWESOME it is sharing my birthday with Mother’s Day? After Green Eggs, we made our way to Grounds for Sculpture in New Jersey, after hearing that La Phemme Phoodie had celebrated her birthday there the previous day. On the way home, we stopped for some Pop’s Water Ice, which was a perfect snack on the warm and sunny day–and our first water ice of the season! The previous day, when throwing around ideas of where to go, what to do and, most importantly, what to eat on my birthday, I asked twitter for early word on Vernick Food and Drink. There wasn’t much of a response, but I said what the hell, let’s check it out. With Chef/Owner Gregory Vernick’s impressive background (CIA grad, Jean-Georges vet,) there was quite a buzz before it even opened. I didn’t want to call during dinner service so I booked dinner for two on Opentable and added a comment that we would like to be seated at the kitchen counter, if possible. 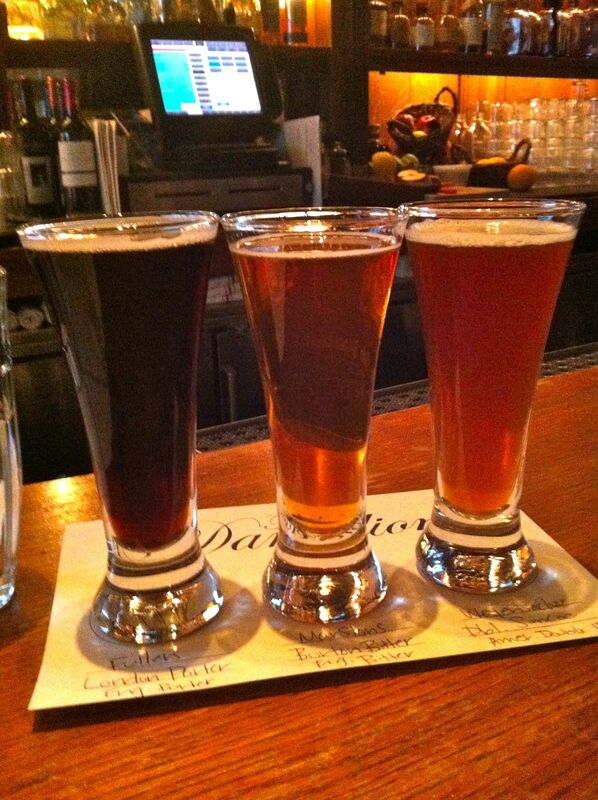 We stopped at Dandelion for a pre-dinner drink and had quite the chatty bartender who assured us that we just had to try the food there and told us all about a dish that all the chefs in the city come to eat. Thanks, buddy. I knew I wanted a cocktail at Vernick, so I decided to get a beer. Dandelion is a British spot, so I figured I’d check out one of their ciders. I’ve been partial to Strongbow ever since we visited my brother who was studying abroad in London in 2004. 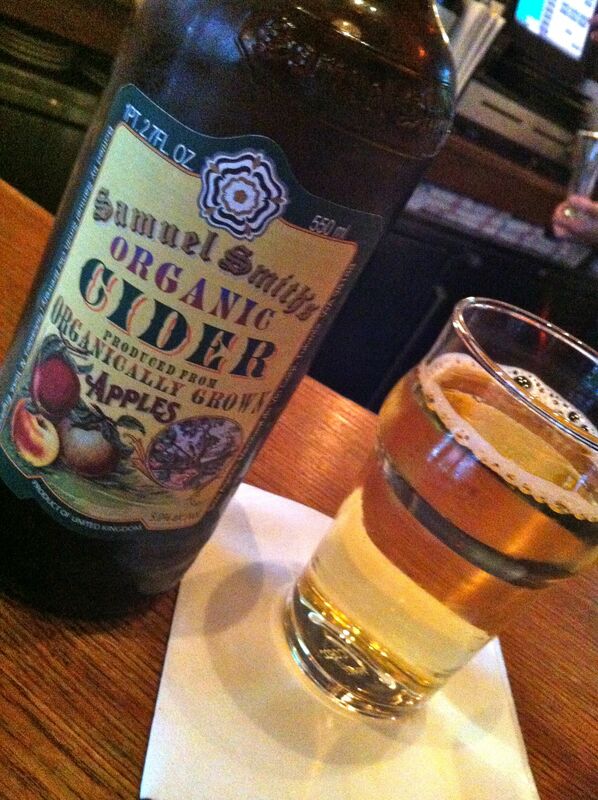 I asked the bartender to recommend a cider based on that interest and he directed me towards the Samuel Smith’s Organic Apple Cider. At $15, it certainly wasn’t cheap, but I figured I could go all out, it was my birthday! His recommendation was accompanied by a glorious tale of how Shakespeare used to drink this cider. How could I NOT order it when Shakespeare used to drink it?? The beer was pretty good. $15 good? I’m not sure. But I was obviously pumped to be drinking SHAKESPEARE’S FAVE BEER! Meanwhile, my husband enjoyed their cask flight which was a steal at $8 for three 5 ounce pours. As my husband and I were drinking and chatting, he picked up my bottle to examine the label, which clearly stated “Est. 1758.” Um, Shakespeare died in 1616 so there’s no way in hell he ever had even a sip of this cider. Dammit! Either way, we got a great laugh out of it. We walked a few blocks to Vernick, which is in an old bookstore’s space on 20th and Walnut. When we entered, we saw Shola Olunloyo of Studiokitchen fame and pastry chef, Monica Glass hanging at the bar. I gave my name to the hostess/owner Julie Vernick and she glanced down at her reservation book. “Right this way.” She was SO pleased that we wanted to sit there. We were brought to the back room with a few tables and a small, 7-seat chef’s counter. As we sat down, the hard-working folks in the open kitchen made sure to greet us without interrupting their dance. We began the evening with a cocktail. My husband stuck with a classic martini while I ordered off the drink menu. 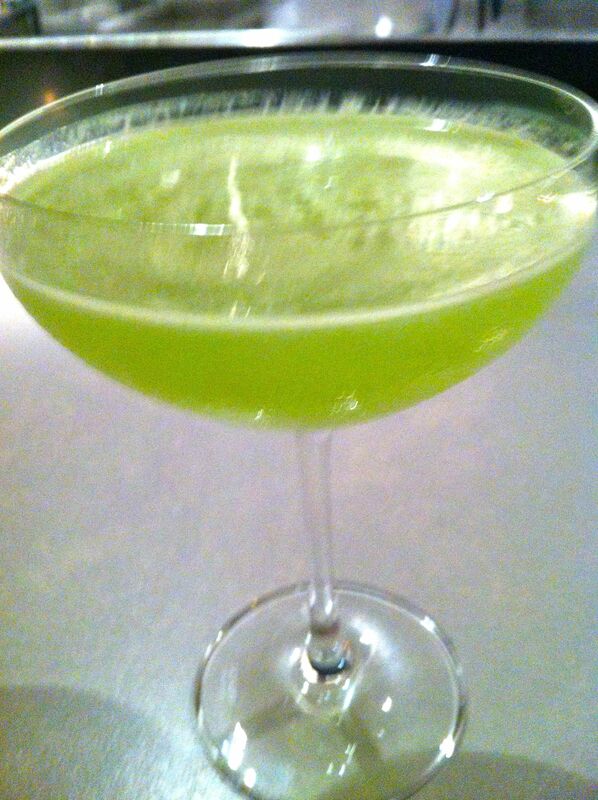 The Green Goddess, with absolut, cucumber water, lime, chartreuse and bubbles tasted of a cool cucumber. The perfect summer drink. 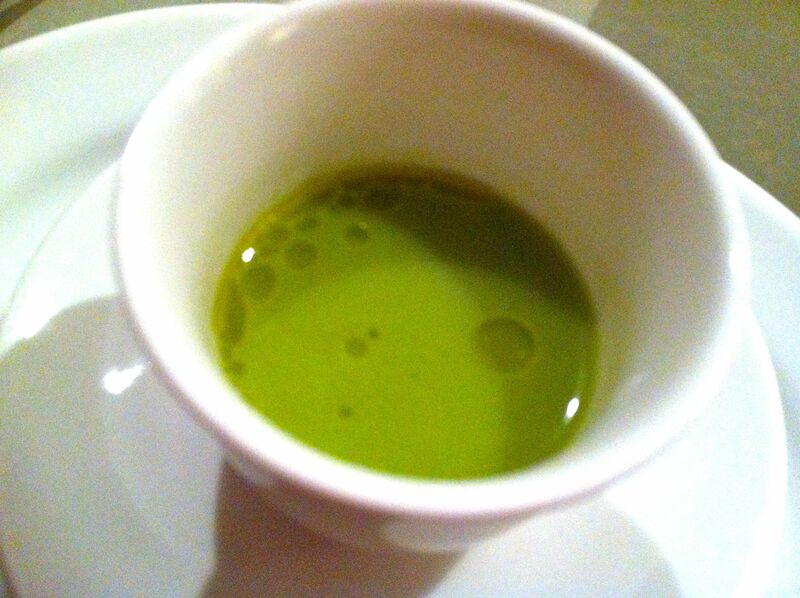 Soon after we received our drinks, they brought out a complimentary taste of pea soup. The soup was fresh and tasted of spring. With the soup, Vernick does the perfect job of preparing your palate for what is to come–simple ingredients with big flavors. Following the soup, we received another gratis bite–one of our favorite dishes of the evening. The parmesan custard is made by boiling down the parmesan rinds and adding egg, of course. It is reminiscent of an Italian street food. 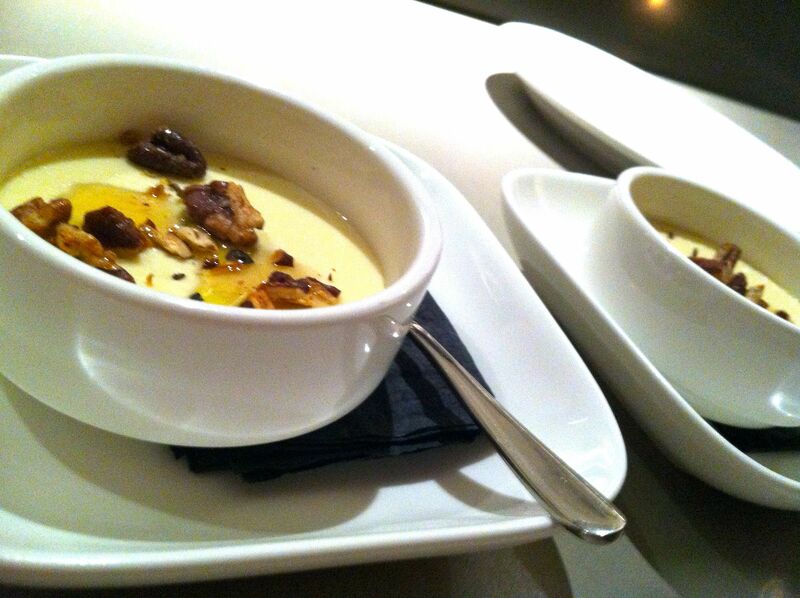 This custard had the sharp tang of a real parmiggiano, cut with the richness of the egg. It was, quite literally, the perfect bite. Following the parmesan custard, we received our toasts. There are a variety of toasts, ranging from $6-14. The toppings change seasonally. We had fromage blanc with pickled ramps (swoon!) 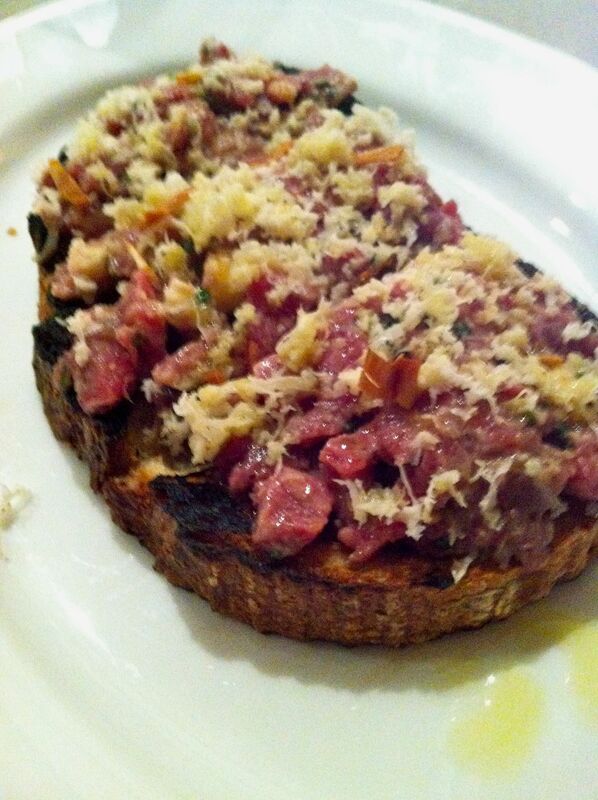 and beef tartare with freshly grated horseradish. 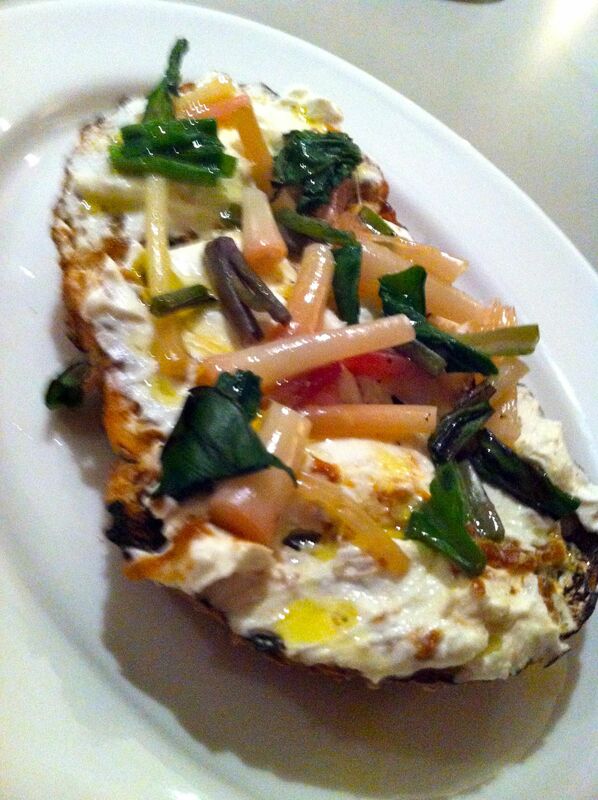 The pickled ramps provided a tangy complement to the creamy fromage blanc. The beef and horseradish provided a similar, but more shocking combination. Look at all that fresh ‘radish! 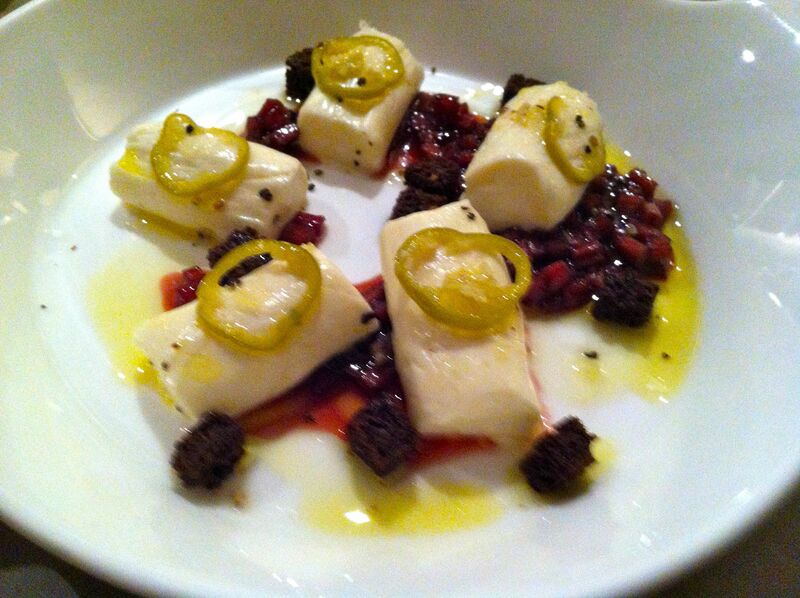 Next up was the house made mozzarella with rhubarb jam. It provided a refreshing bite. The mozzarella was a bit denser than I was accustomed to, but the rhubarb jam paired nicely with the creaminess of the cheese. The only thing I didn’t love about this dish were the tiny dark rye croutons. While I liked the concept of an added crunch, they were just a little too hard. A simple beet salad followed. It’s hard to mess up a beet salad, but it’s also hard to really nail it. 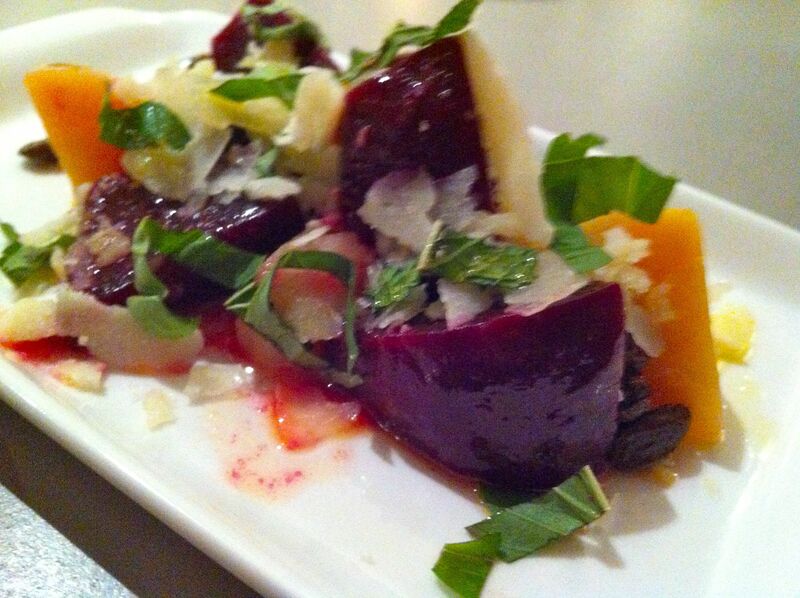 I’ve had great beet salads at both Barbuzzo and Vernick lately. It was just so refreshing. And the moliterno cheese added just a bit of sharp creaminess to the dish to cut the richness of the beets. Throughout the evening, we chatted with the chefs during the down times. They were working hard, but there was an ease to their work–you could tell they were really enjoying themselves. About halfway through our meal, a single gentleman sat down at the end of the counter and we started chatting with him. As it turns out, he was the owner of Rotisseur and fed the Vernick Food and Drink family many, many meals as they were building and developing the restaurants. Our next two dishes were on the heavier side–the pacing was spot-on throughout the evening, starting with the toasts and moving graduating to the larger dishes. Our first pasta was the only real miss of the night. 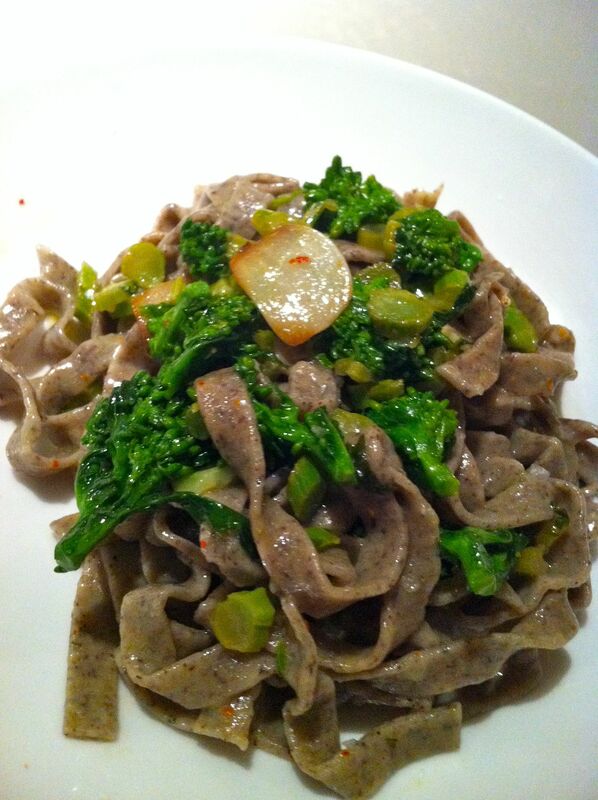 A buckwheat pasta with broccoli rabe and lemon, it kind of just fell flat. The next pasta, however, hit the nail on the head…hard. 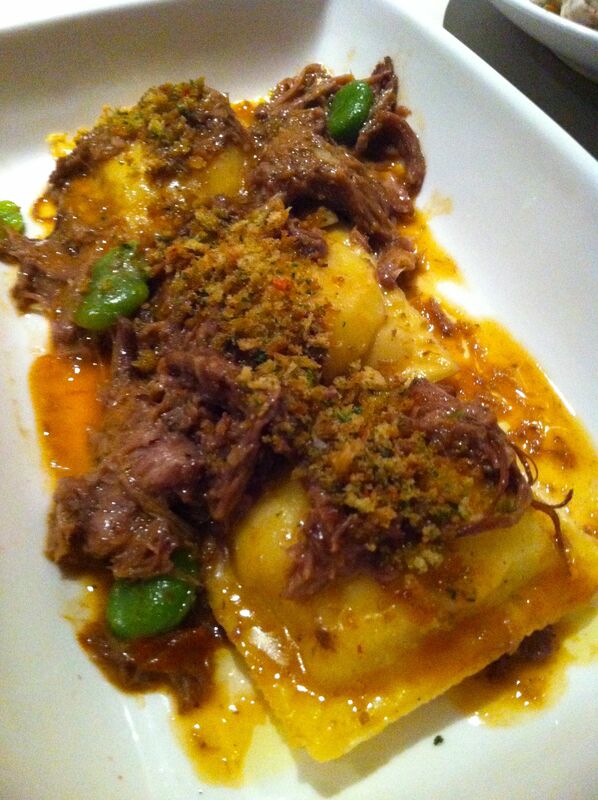 The potato ravioli with braised lamb was something I could keep eating and eating for days. The pillowy ravioli was filled with a simple potato mixture but the braised lamb was rich, meat and just plain delicious. I loved the crunchy bread crumbs sprinkled delicately atop the dish. We ended up forgoing dessert, although I can only imagine that Pastry Chef Angela Ranalli, who splits her time between Vernick and Le Virtu, is pushing out some amazing food. Although we went the first week, there were no major kinks. The food was one of the better meals I’ve had in the city for a long time. If I lived closer, I’d be a regular for the creative cocktails and toasts at the bar. I’m sure my wallet (and my husband) is pleased that I don’t.